I have mentioned before how much I love having my girlfriends over for our famous “get-togethers”. They are always filled with good food, friends, stories, and laughs. It has become a bit of a tradition for me to host the Christmas get-together. I always decorate my place so I try to plan parties so I can force others to enjoy it. I met these wonderful girls while working at the same company, and we were fortunate enough to have some amazing travel experiences that bonded us. I can’t believe we have all known each other for almost 8 years! Where does the time go? A couple of years ago, before one of our Christmas parties, we were emailing about what everyone was going to contribute. I mentioned that I was going to make a champagne cocktail with rosemary. One of my friends wrote back and said, “Ooh! Fantasy Pants!” I thought that was kind of odd, but also kind of a cute name for a drink…. I guess. I had no idea where she came up with it but I was going with it. When she showed up at the party I asked her about it and we realized she was trying to write “Fancy Pants” but that darn auto correct had a different plan and she sent it off without realizing it. That original cocktail was just so-so, but I really love this version. It deserves the name Fantasy Pants. I have had St. Germain recently in a few cocktails and really liked it, so that was my inspiration for this drink. St. Germain is a French liqueur made from elderflower blossoms. Sounds tasty, right? St. Germain is mixed with fresh lime juice and homemade rosemary simple syrup and then topped off with sparkling wine or champagne. This cocktail is really refreshing and not too sweet. 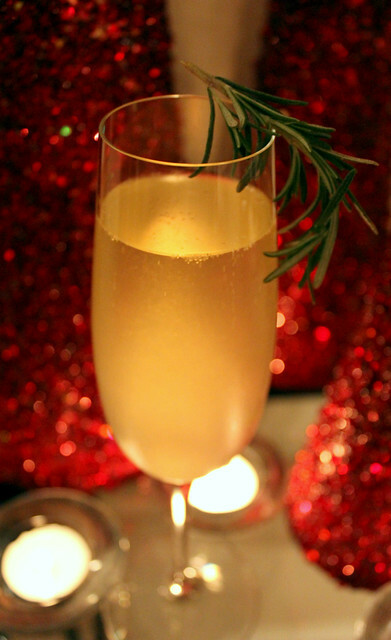 The subtle hint of rosemary makes it a perfect drink for the holiday season. I am definitely keeping Fantasy Pants in my repertoire. Fill a martini shaker with ice and add the simple syrup, lime juice, and St. Germain. Shake well. Pour into five champagne flutes and top each glass off with sparkling wine, prosecco, or champagne. *To make the simple syrup combine ½ cup sugar and ½ cup water and 3 sprigs of rosemary in a small saucepan. Bring to a boil, reduce heat, and simmer for about 20 minutes. Remove the rosemary and chill the syrup until ready to use. I love your blog, Lindsey! I am using several of your recipes for Christmas Eve and am so excited... yummy and easy (so far!) I am definitely passing your blog on to some friends that will LOVE it. Thanks for all the great ideas. You made my day!! Thank you so much for taking the time to leave a comment. I would love to hear what you tried!